PRESIDENT Lungu is a seasoned and intelligent politician but the opposition are ever trying to fish out wrongs from him, Patriotic Front chairperson for Information Frank Bwalya has said. Father Bwalya said President Lungu is a listening politician who has a good Cabinet in place that will deliver to people’s expectations. Fr Bwalya said this yesterday during a two-hour long radio programme on 5 FM dubbed “Burning Issue”. “President Lungu has protected the legacy of President Sata and has brought so much development under difficult times”. Fr Bwalya said. He said the PF has remained a pro-poor party. “President Lungu is a good man and we are confident that he will win next (this) year’s election. Even the opposition are admitting that PF is working,” Fr Bwalya said. He said currently, no opposition has the capacity to dislodge the PF. And Fr Bwalya says President Lungu has actualised the declaration of Zambia as a Christian nation by building the National Tabernacle House of Prayer. “President Lungu is a godly man. And this tabernacle will live among us,” Fr Bwalya said. Fr Bwalya said he enjoys a good relationship with the former President and he respects him. Njala a Bambo,yalowa. Koma cifundo neo. Ngaeutukilanji ku chalichi? Abemba akuti “seban wikute”kkkkkkkkkkk! Which Sata’ legacy is this lunatic talking about him. Is it not Frank Bwalya who told Zambians that Sata was a chumbu mushololwa? 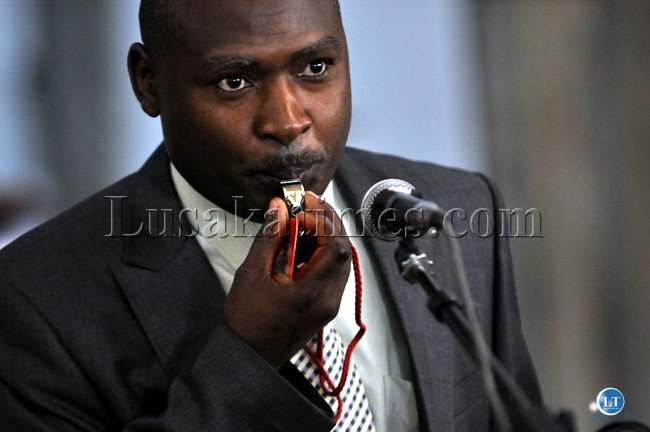 Lungu’s Cabinet id mediocre and Lubu himdelf is an average lawyer. Was Lungu not debarred for embezzling a client’s money? I fear sycophants like this will be the first to switch allegiances if someone else is in Plot One. Mr President, please be weary of these moral-less praisesingers! Possibly smokes the Weed too. LT, this rubbish this clown vomits is really not NEWS! Which “legacy” is he talking about? The millions of BORROWED money spent on his “medical tourism”? Or the HUGE DEBT that Zambians now have to repay? Or that our Kwacha is the worst performing currency in the WORLD? Or the LOAD SHEDDING that has crippled our economy? That is not a “legacy” that needs protecting. IT IS A BIG, HUGE PROBLEM THAT NEEDS FIXING! This dull clown should just be quiet if he cannot talk any sense. Thankyou for reminding me.Maybe Kambwili had appoint for the first time when he said in Bemba that when a priest leaves priesthood he starts going mad.Suddenly “chumbu munsholola” has a “legacy” worth protecting. Because he is feeding you beggar that’s what empty tins only think about prase for his master you are no better than a dog. How can you call a cabinet full of low calibre people like Kambwili, Yaluma, Monde, Siamunene, Kapata, etc a good cabinet? My foot! Even school was a problem for a number of them! We have really embraced mediocrity in this country. Just check the background of these people and their low achievements before entering politics. Politics have added value to them instead of them adding value to politics! Iwe Ci ponyo ponyo bwalya, nisebana wikute cacine. Pamenso kwati ni kolokombwa uulefwaya kusanguka kabundi. If you think Lungu is good, put him in your kitchen unit if you have one. You and him are not good for Zambia. When its all good,sing your praises to your master.we all know why you since praises,running away from hunger.if you want to see the intergrity of someone,see them how they sing praises when their tummies are full. GOVERNMENT THAT RULES BY LIES AND DECEPTION CAN NEVER PROSPER. THIS IS A NEW YEAR AND IN NO SMALL MEASURE SOME OF US WHERE HOPING THAT MAYBE OUR LEADERS CAN USHER A NEW BEGINNING. A FRESH START ONE OF HONESTY AND PRUDENCE. INSTEAD WE ARE STARTING OFF WITH THE SAME LIES TOLD BY THE SAME LIERS. PEOPLE LIKE FRANK BWALYA ARE THE REASON WE ARE NOT RECEIVING OUR BLESSINGS. YOU CAN NOT HAVE A GOVERNMENT THAT OPENLY MOCKS GOD BY REWARDING PEOPLE THAT THINK THEY CAN USE THE LORD’S NAME IN VAIN. BWALYA IS A CURSE TO ZAMBIA AND ANYTHING HE SAYS IS MEANT TO DECEIVE US. BWALYA IS EATING THE FORBIDDEN FRUIT OF CORRUPTION PROCEEDS EVERYDAY. UNTIL WE GET RID OF SUCH PEOPLE WE WILL CONTINUE TO GO DOWN HILL. NOTHING BWALYA SAYS IS GOOD FOR ZAMBIA NOTHING!!!!! BA PF KUWAYAWAYA FYE! Cadre talk. Cadre talk. Cadre talk. More Belly taik. Of such people the media can help the nation with publishing their political profile! We tend to forget easily and Mr Frank Bwalya wants us to believe he has integrity in politics! Nothing that comes out go Frank Bwalya will make any sense to me! He is in the Munkombwe grouping of politicians only that the Munkombwe does not hide his honesty and tells it as he sees and feels it for himself! Whatever they smoke in the Panga Family is really portent. Such a statement can’t be attributed to a sane person. The Sata he’s referring to branded this same Cabinet Useless many times the cabinet included Lungu the Drunkie himself. How can it be good today?